These Halloween Jar Lanterns are a great way to light up your porch, sidewalk or windowsill! They are extremely easy and affordable to make! You could do it for yourself, or even do it with the kids! You can obtain most of the supplies needed for this project at the dollar store or most major retail locations. Most items I had on hand, but they should be inexpensive. Begin by taping off the faces, I suggest using masking tape over scotch tape or duct tape. You can also consider Blue Painters tape. Shape out eyes and mouth. You can add accepts like scars, waves, eyeballs later with a black sharpie. Next, paint the jar. Green is great for Frankenstein, Orange for Pumpkin, and White for a Ghost. Allow the paint to try and then remove the tape carefully. You do not want to peel your paint! If necessary you can add details to your jar using a sharpie! For example, I added hair, stitches and bolts to my Frankenstein jar! Make your lanterns glow. Add tea light for a nice glow. For safety, consider buying flameless tea lights. Frugal Tip – Consider using Jars you already have in your home to avoid spending money on them. Go through your refrigerator and look for a pepper jar, pickle jar, jelly jar and many other ideas. I love the thought of having different sizes. Many of the other items you likely have in your home to leaving your out of pocket expense with a potential of $0. 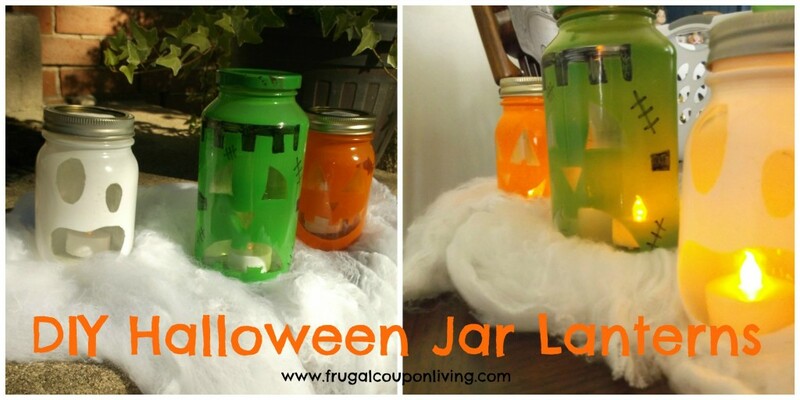 Like the DIY Halloween Jar Lanterns? Don’t forget about the DIY Dollar Tree Fall Candles or the FREE Trick-or-Treat Printable!